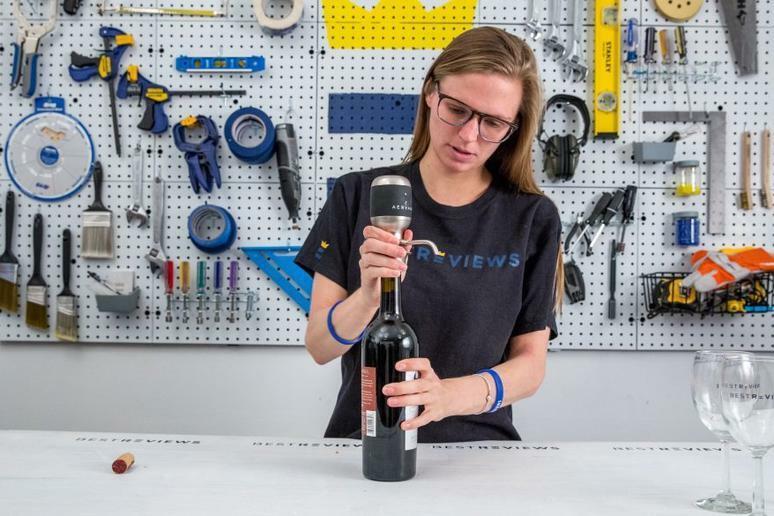 Want your favorite bottle of wine to taste as good as it possibly can? Then you need a wine aerator to keep beside your wine collection. An aerator adds oxygen to the wine as you pour it, which reduces the bitter flavor of the wine's tannins for a smoother taste. A stopper or in-bottle wine aerator is a device that fits directly into the neck of a wine bottle, so it can both aerate the wine and serve as a stopper. When you pour the wine, it passes through the aerator to introduce the oxygen. A stopper aerator doesn't add as much air to wine as other types of aerators, though. A decanter or in-glass wine aerator allows you to decant and aerate your wine at the same time. You add the wine to the top of the decanter, and then it passes through the aerator to add oxygen. There's usually some type of spout at the bottom that allows you to easily pour the wine into a glass for drinking. An electric wine aerator is usually the most effective type of aerator, but it costs more, too. You place the aerator at the opening of the bottle and press a button to filter the wine through the aerator and then pass it into your glass. An electric wine aerator is quick and easy to use, so it's ideal if you drink wine often. Wine aerators aren't particularly large appliances, but some are bulkier than others. If you plan to leave your aerator on your bar cart, size probably doesn't matter. However, if you're going to store it in a drawer, you may want a more compact option. A stopper or in-bottle model is usually the smallest type of aerator, so it's an ideal choice if you don't have much room to store your aerator. Because they can have many nooks and crannies, you want to choose a wine aerator that's easy to clean. Some models are dishwasher-safe, which offers the easiest clean-up. Models that must be hand-washed often include a brush to help remove any residue. Q. What's the best type of wine aerator if I want to aerate an entire bottle at once? What we dislike: It doesn't work well with larger wine bottles. What we dislike: It doesn't fit all bottles, so drips may occur. It sometimes falls out of the bottle, too.